This was out of a very large wealthy estate. Otherwise looks neat and old! This box has no makers mark but does have an artist signature, see photo. It is cobalt and light blue with elaborate silver overlay. A super addition to any collection and no reserve! We are a husband and wife team with over twenty years experience. IN GOOD CONDITION BUT MISSING ONE DRAWER. Antique WMF Austria Silver Plate Dresser Box "Jardin D'Amour P.Rubins"
Size: 5" x 6 1/2" x 2 1/4" tall. Matson MCM Hollywood Regency - 24K Gold Plated Jewelry Casket Box Ormolu Glass Mirror & Dresser Tray Set, includes large oval mirror tray 18" x 11", beveled glass hand held mirror 14.5" long and triangular glass lid jewelry box 5" x 3.5". GILDED INTERIOR. HALLMARKED BUT MAKER AND EXACT AGE IS UNKNOWN TO US. TOTAL WEIGHT OF 41 GRAMS. BASED ON MY BEST KNOWLEDGE THIS BOX WAS MADE IN LATE 1800'S OR EARLY 1900'S - OPENS AND CLOSE PROPERLY. Trinket Box. Art Nouveau. ~Beveled Lid~. ~ Etched Leaf Pattern Sides~. ~Mirrored Bottom~. We Are Always Happy To Assist. IN FAIR CONDITION FOR AGE - GENERAL WEAR. One may wish to polish but this is stunning with its aged character complete with bottle most often missing. IN GOOD CONDITION FOR AGE - GENERAL WEAR. Gorgeous jewelry casket jeweled with miniature petit point. Fine addition to any collection. Approximatley 2" high 4 1/4" wide 3 1/4" deep. Gorgeous jewelry casket. Fine addition to any collection. Approximatley 2" high 4 1/4" wide 2 3/4" deep. It depicts a forlorn looking maiden as her beau holds her hand. His dog sits by his side. A magnet does not stick. This is a larger size for this type of old box. It has its original silk lining under the lid but is missing the silk lining inside the box. 6.8 CM x 5 CM x 1.8 CM TALL. Rare and a must have for the serious collector. One may wish to polish but this is stunning with its aged character. 6 1/4” x 5 1/2” x 3”. This is Such a Lovely Vintage`Antique Ornate SilverPlate Swirl Velvet Lined Vanity Trinket Box!! !Heavy,with an Ornate SilverPlate Flower Finial on Lid and a Deep Burgendy Velvet Lining Inside Box plus Under Lid and Bottom of Box with a Scalloped Rim,it is in Wonderful Vintage Condition,with No cracks,tears or dings and measures 23/4"tall x 33/4"wide across open top x 5"wide across bottom!!!. The lid and box are embossed with raised designs that are hand painted in green & blue. If your communication is less than courteous or professional, we will be unable to assist you. It is not in new condition nor is it mint. Sterling Silver 'Shoe' Trinket Box - Antique Edwardian (1907). ART DECO CARNIVAL GLASS VASE IRIDESCENT BEEHIVE RIBBED ANTIQUE VASE. Edwardian sterling silver jewelry box. Made by Reed & Barton in Taunton, Mass., ca 1920. Rectangular with curved corners and flat, hinged, and overhanging cover. On cover is engraved laurel wreath with ribbon (vacant). Edgar Berebi. Signed Berebi Limited Edition. Trinket Box. Modeled in the shape of seated frog. Limited Edition LE. LOT #42109 SHELF #12B. The top lifts up to reveal a small storage space within. WANTED: Antiques, Art, Collectibles, Jewelry & MORE! Mouse 65mm long x 20mm tall. Up for your consideration is this untique beautiful antiqueVictorian embossed molded satin dresser trinket box. This unique scroll and ribbed pattern is an opaque white with satin finish and has a beautiful spray of aqua blue flowers on the lid accented with gold and a lighter aqua blue. Art Deco 0.28 ct Emerald 0.15 ct Diamond, Sterling Silver Mirror Compact . Hand Wash fine porcelain/china and glass and do not place in the dishwasher or microwave. This is a beautiful, unique piece. Rare and a must have for the serious collector. Jeweled Opaline Egg Box. One may wish to polish but this is stunning with its aged character. 4” x 2 3/4” x 3 1/4”. Gorgeous jewelry casket. Fine addition to any collection. Approximatley 2 1/2" high 5 3/4" wide 3 3/4" deep. Old fashioned sterling silver trinket box. Bellied with short and inset neck. Hallmark includes no. 100. Antique 1950 Art Deco Ornate Celluloid Vanity Boudoir Beauty pair of Boxes with cover. marked Dupont Pyralin USA. h Marriage Box Dates to early to mid 1800's These old Boxes originate from Normandy France. They all have similar artwork and paper lined insides. It is a formal wedding chest that the future husband orders and has an artist decorate the front and side panels and the inside of the box and lid for the bride to put a part Of his dowry and which is intended to decorate the nuptial chamber. measurements 15.5 x 7.5 x 7 in. tall Antique not reproduction .....looks to be restored as paint is so nice. Excellent Condition Original lock still has its key with it. Notice it has a key holder inside the box to store it when not in use. Sturdy...no problems. Great box for decorating...shows extremely well. great box for trinkets and important papers. all items are sold as is. ON SIDES OF CASKET. THERE ARE 8 PANELS OF GLASS ON SIDES. FILIGREE WORK AROUND EACH BEVELED PIECE OF GLASS. 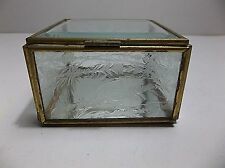 A BEAUTIFUL PIECE TO ADD TO A.
Rectangular with straight sides and sharp corners. Balos- Made in Taiwan. Glass Jar with lovebirds has moderate age related discoloration/wear to finish. One small ding to outer rim of jar base. Bell - Lily of the Valley frosted glass accent 6.5" tall. Trinket Box. Art Nouveau. Glass Dish Is Excellent. With Gold Flowers. FREE Trial! We Are Always Happy To Assist. The tip of the tail is broken off. we didn't see it until now. Velvet Lined, Artist Signed ...... No Reserve! 7in total height. No maker's marks. Hand painted Butterfly Glass possibly Amia Trinket or Jewellery Box with no chips or cracks. 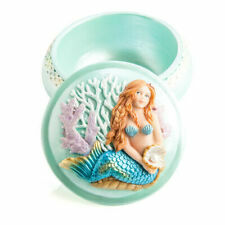 • Jewelry, Trinket Casket or Box. The glass is wonderfully clear with prismatic quality when light passes through the cut beveled edges. The bevels are all hand cut with superb polishing. The fabric panel is loose.